Peggy Trowbridge Filippone. The Spruce Eats, 2009. Jerky is an age-old method of preserving meat, fish, and poultry. Our forefathers dried meats and seafood into jerky as a matter of necessity, to preserve the food for long periods without refrigeration. Nowadays, we consider jerky as a convenience food, perfect for hikers, campers, or just a simple, non-messy snack. Commercial jerky products come in many flavors with any number of preservatives. Traditionally, jerky is long, thin strips of meat (most commonly beef) that is salted and sun-dried. Native Americans have long used this drying process to preserve meats and fish for winter or traveling. The meat was often reconstituted to create ​a hearty snack, and this concept still works. 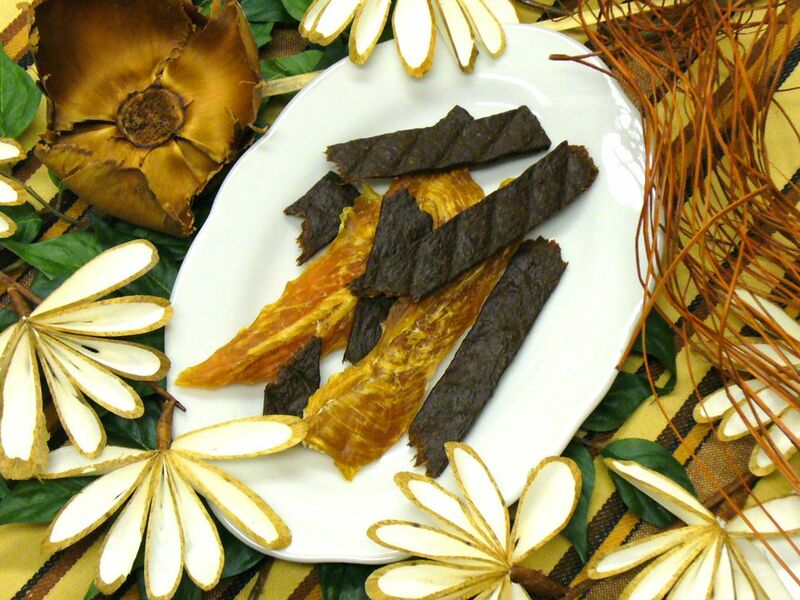 Today, jerky is made of wild game, poultry, a wide variety of fish, and of course, beef. It can be made with many different seasonings and flavors, salted and unsalted. Salt is traditionally used as the main preservative for jerky, but acids such as vinegar and citrus juice in marinades can also help to kill bacteria. Jerky can be made without salt, but its shelf life will be drastically reduced. A favorite of campers and hikers, jerky is lightweight, flavorful, and full of protein. The concept of making jerky is simple: constant low heat and moving air to dry out the seasoned meat. However, there is a fine balance to be achieved. The heat has to be high enough to withdraw moisture, but not hot enough to cook the meat. Adequate airflow is necessary to move the moist air to disperse it. Homemade jerky is easy to make. It can be made from a variety of meats (wild and domestic), poultry and even seafood. By making your jerky, you not only control the ingredients, but you also save money.